A yummy odd looking biscuit I rounded up for dinner. I listed off the ingredients on the left but I didn't include the topping. I used homemade mashed potatoes on this one but you can top it with anything! Macaroni and Cheese, or anything else you can think of! These are delicious, quick and easy to make when you've got the munchies and need something to fill you up on the go, or just to serve with a nice dinner. Also try the dessert version of this! Just instead of Chili use strawberry glaze, or chocolate, whipped cream well you get the picture. This recipe made 10 biscuits! Follow the directions on the back of the container on how to make the biscuits and put them in a muffin/cupcake pan. 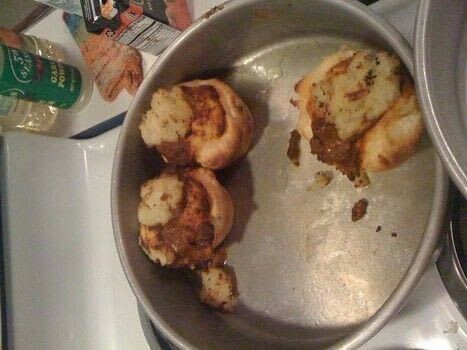 And once you cut your pieces of dough grease the inside of the muffin pan and push in the raw dough. Next, with a spoon push in the center place about a tablespoon of chili in the center and spoon on a smaller spoonful of your topping of choice. Continue this process for each biscuit. Place pan with the yummies in your preheated oven and let the magic bake for like 12 minutes. Pull out the pan when it's done, allow biscuits to cool for a moment before you place and arrange them on a plate. Garnish with cheese or anything at this time.